Look how happy my son is to receive this new DIY felt dinosaur stuffie I made him with some felt, DMC floss, batting, some sew-on googly eyes and some hand stitching. Sure, you could machine stitch it with thread, but I like the look of the DMC floss hand stitched all around the edges. It adds a certain handmade charm to the piece. My son is on a bit of a dinosaur kick at the moment and is saving his money to but a 3ft. 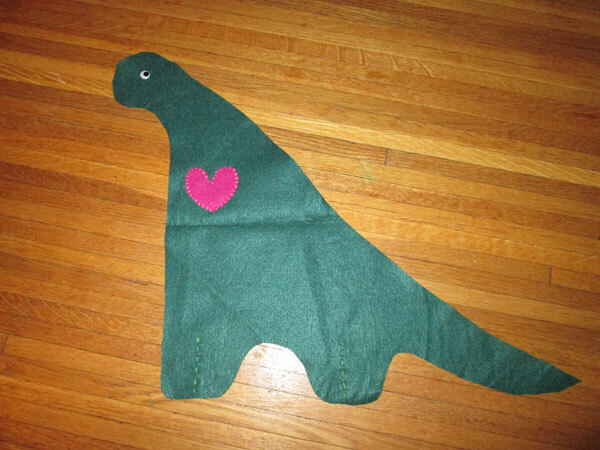 T-Rex stuffed animal so I knew he would appreciate my version of a stuffed Apatosaurus . From start to finish (including make the paper pattern) it took me only 1 1/2 hours, which I did while i watched a movie. 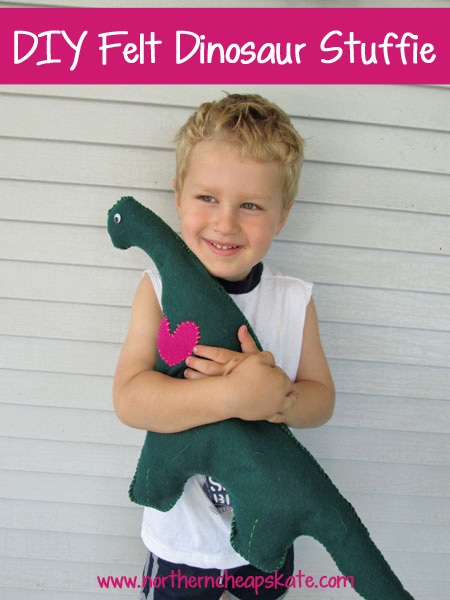 I will share with you the steps I did so you can efficiently create this same stuffed animals or come up with your own idea for a handstitched dinosaur stuffie. 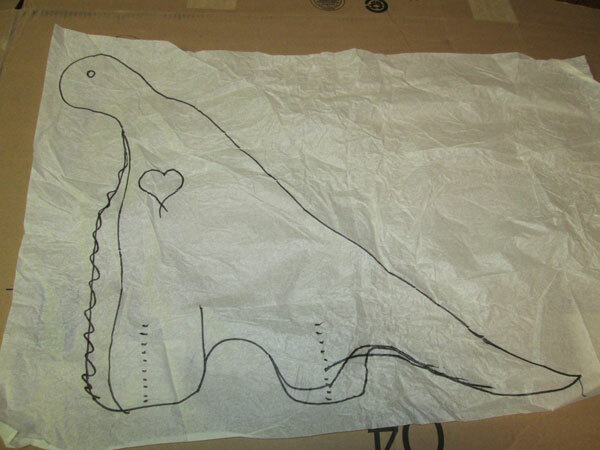 First I took a piece of tissue paper (saved from a package I received) and used a marker and drew out a pattern. I put some cardboard underneath so that the market didn’t damage the table. You can see I made modifications to my drawing, since I am not the best at hand drawing things. I also drew in the accessories I planned to stitch on so that I could see how it looked in proportion to the rest of the stuffie. After drawing my pattern, I cut it out and pinned it to my felt. You can buy felt off the bolt from JoAnn Fabrics or other fabric stores. 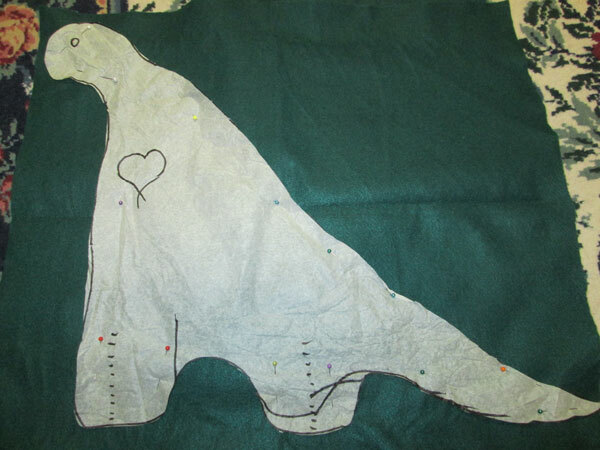 You will need to have the fabric doubled up so that you are cutting out 2 pieces when you cut out around the pattern. Then cut out your pieces. Decide which is your front and stitch on your accessories BEFORE you stitch the front and back together. 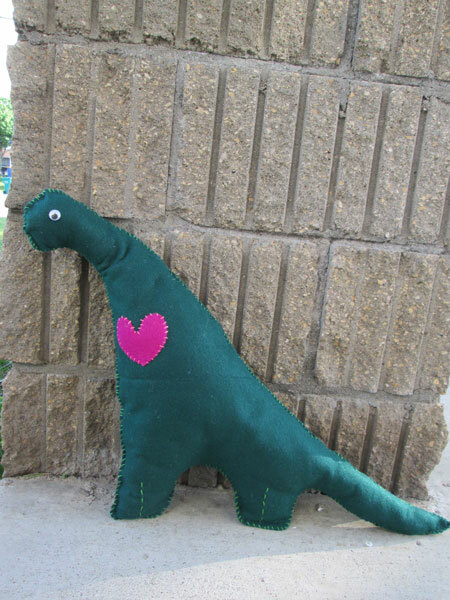 In the case of my dinosaur stuffie, I stitched in to place a heart, a googly eye and stitches to show legs. Next you will pin your front and back pieces back together so that they don’t move while you are hand stitching. Then using DMC floss begin stitching are the perimeter of the stuffie. I started at the front of the hind legs and stitched around the tale, up the back, around the head and down to the front legs, leaving an unstitched area on the bottom between the legs. Finally, fill with batting through the unstitched area. I use the a pencil (eraser end) to help push the batting into the tail and fill on the head. Once it is filled with batting, finish stitching together. Check out the Monster Stuffies I also made from repurposed sweaters and some felt. Awww I think I feel a felt koala stuffie friend being made soon lol I love your son’s smile. Adorable, makes me wish I could sew. This is so cute!!! I’ve been wanting to make some felt stuffies, some felted ones, and a waldorf doll. But usually the expense makes me procrastinate about the latter two. I should at least do the felt stuffies, felt is very cheap, and I know a place to get eco-friendly recycled felt! Thanks for sharing this adorable DIY! This is such a cute idea. I love how he helped. Thanks for sharing. Oh my goodness it’s cute. I love that dark green you got for the material too!